Due to some extra benefits compared to other lights, LED grow lights become a must-have item for indoor farming including cannabis growers. Most importantly nowadays some Full Spectrum LED Grow Lights are actually cheaper than ever! I am going to disclose VIPARSPECTRA 300W Review the smallest model available from VIPARSPECTRA. When you think to buy LED Grow Lights for your indoor plants, I know many things will ping in your maid. Because without adequate light Spectrum your plants will not be able to grow properly, in fact, it will not move from vegetative to flowering. So you have to pick the best LED grow lights on the market which can support your plants all stage of growing. This is one of the best seller and most recommended LED grow light for Beginner & intermediate level growers. 4.0.1 Due to being a low price Grow Light quality of materials is doubtful. Am I right? 4.0.2 Why coverage area is small in the blooming phase? I already told you VIPARSPECTRA V300 has designed for beginners but this is not cheap in quality. I call this light Affordable, which comes at an attractive price to support your indoor plants with efficient and bright light. 12-band full spectrum of LEDs, including Infrared makes VIPARSPECTRA Reflector Series V300 ideal for many types of plants. When a seed is germinating it seeks red and far-red (Infrared) light waves. As those infrared light spectrums are far away, the plant will try to reach it so outdoor cannabis plants can grow to be 7′ or taller. Generally, Indoor growers have limited vertical space for plants. 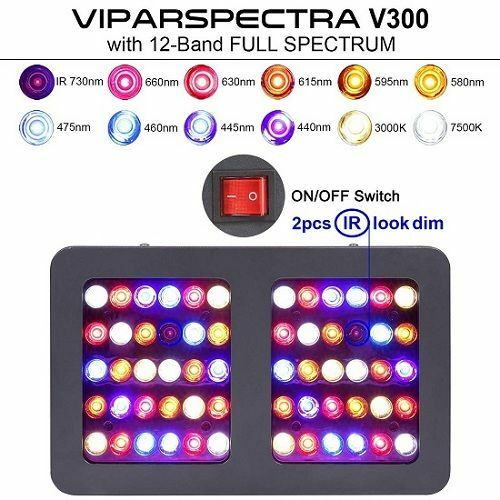 It is really impressive that because of VIPARSPECTRA Reflector-Series 300W LED Grow Light your cannabis plants won’t need to stretch as much to get the Infrared light spectrums. These grow lights equipped with superior quality 60pcs 5W Bridgelux/Epileds LEDs. Generally LED Focusing angle ignored by buyers but it’s important for the cultivator to achieve better canopy penetration & plants health. This Plant Grow Light comes with 90° LED Focusing angle. Balanced PAR output is very important for every plant and the measurement of PAR tell you how much edible lights are getting your plants. For seedling, necessary PAR output is 200-400 µmol m-2 s-1 on average & as your plant grows the requirement of PAR increases. In the flowering stage, your plants need more than 400 µmol m-2 s-1. 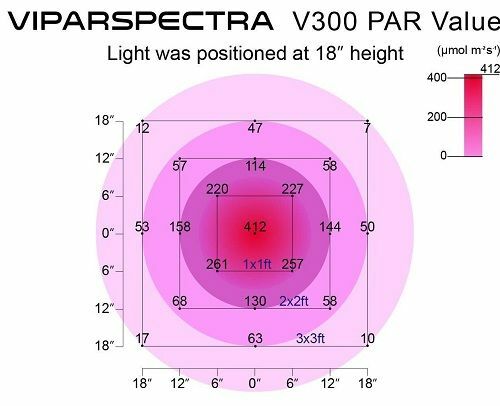 At 24” height, the PAR output of VIPARSPECTRA Reflector-Series 300W is 237 µmol m-2 s-1 at the center, which is perfect for seedling. You can fix your light at this height primarily and move it nearer for higher PRA as your plants demand. When your plants come to the flowering stage you need to set it at 18″ height while the PAR output will be 412 μmol m-2 s-1. Fluorescent and HID/HPS grow lights generally consume more power than LEDs. This can replace traditional 250W HPS or MH grow light while consuming only 128 watts while working! Moreover, these LED lights don’t require a ballast. Management of heat within the grow space is the biggest challenges for indoor gardened. This lighting system equipped upgraded aluminum cooling heat sinks and high-speed quiet fans for heat dissipation inside grow tent. So these lights run almost 70% cooler than comparable HIDs. This light is relatively small so it’s perfect for the first growing experience. VIPARSPECTRA V300 recommended for 2x2ft vegetative coverage at 24″ height & 1.5×1.5ft flowering coverage at 18” height. But don’t worry much because so you’re free to extend your grow space any time by adding one more light as this LED lights featured with daisy chaining ability. You have to adjust VIPARSPECTRA 300W distance from plant according to growth stage. A mature cannabis plant commonly takes around 1 square foot to grow. So you can grow 4 marijuana plants with this light generally. But think about 3 square foot flowering coverage! so I advise for 3 plants unless you’re going to add supplemental light for the flowering stage. VIPARSPECTRA comes with 30-days satisfaction or return guarantee and 3-years local warranty with excellent customer service. Lifespan of these plant grow lights is 100,000 hours. If you turn on this light 18 hours every day it will last for 15 years! So most probably you will upgrade this before needing a new one. Make a look chart below, here is a comparison study between VIPARSPECTRA V300 & same wattage LED Grow Lights from different manufacturers. Frankly speaking, this grow light is the best choice for Vegging & less ideal for bloom. But please don’t think it’s possible to grow a full plant using this light, I am just talking about the best pick. These small LED Grow Lights is not waterproof so this light recommended for indoor use only. Due to being a low price Grow Light quality of materials is doubtful. Am I right? 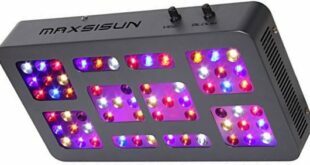 This grow light is inexpensive but it comes with durable and reliable Bridlux/Epileds LEDs including high-quality panel and upgraded aluminum heat sink. Why coverage area is small in the blooming phase? This is an extremely common question mainly from beginner’s. Yes, it’s true that the coverage area for vegetation and blooming is different & manufacturer will suggest you about this. The main reason is, during vegetation plants don’t need more direct light or more intense light. But during flowering stage plants need more direct light to sustain better health so we need to adjust the distance of the light. 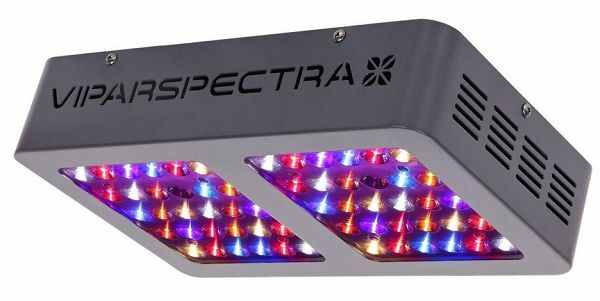 I hope that now you have a clear concept about VIPARSPECTRA Reflector-Series 300W LED, a budget-friendly full spectrum LED grow light for indoor growers. I will say Big Yes for beginners. If you ready to invest more you may check VIPARSPECTRA Reflector-Series 600W from the same manufacturer. To see more best LED Grow Lights from different brands please check our home page.